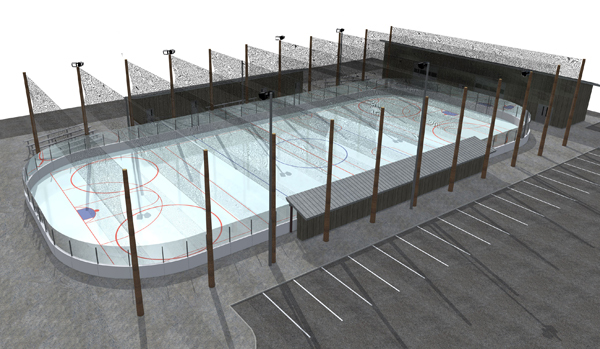 After nearly 20 years of fundraising and planning, the Hailey Ice organization will soon have an ice rink of its own. The Hailey Planning and Zoning Commission on Monday approved the design of a 17,000-square-foot refrigerated rink on city property at Wertheimer Park, near the city’s rodeo arena. “This is long anticipated and will be a real asset to the community,” said P&Z Chair Jay Cone, who led a review of minor requirements deemed sufficient by a unanimous vote by the commission. Numerous Hailey Ice supporters showed up at Hailey City Hall to hear the commission’s final decision, including John Olsen, who dressed in a hockey uniform for the occasion. Hailey Ice has worked for numerous years to offer usable ice at various locations in the city, all the while raising funds to build a permanent facility. Architect Shaun Kelly presented designs that include numerous trees and shrubs for landscaping, an energy-saving shade to protect the ice from sun, and other guarantees that the design for buildings totaling 3,935 square feet in size would be energy efficient. The rink will be used from November through March. The foundation for the rink was built several years ago with $430,000 raised by Hailey Ice over many years. Completion of the rink was stalled when an investor’s promised funding did not materialize. Kelly said the current plan includes a provision to eventually complete the rink with a covered roof for all-season play. Hailey Ice Executive Director Sarah Benson said the rink completion has been made possible by donations from Lynn Campion through the Deer Creek Fund, of the Helen K. and Arthur E. Johnson Foundation and the Barbara J. Hartley Fund ($300,000 total), and The Nancy Eccles and Homer M. Hayward Family Foundation ($500,000 total), and from an anonymous Hailey couple ($300,000 total). Benson said the rink could take shape in July, with the goal of completion by November. “It is a great feeling. It has been a very long process. I can’t tell you the number of emails and congratulations we have already received,” Benson said. ·The Hailey Planning Department reported 40 building permits so far this year, totaling $2.8 million in assessed value. Last year at this time, the city had building permits totaling $1.8 million in assessed value.